The innovative GateshoX system ensures a smooth and quiet ride for your sliding gate. GateshoX not only dramatically reduces sliding gate noise, but also minimises rail wear and corrugation, leading to long-term and reliable operation. The patented suspension system is ideal for high-speed gates, is suitable for angle or round rails and the wheels are incredibly easy to change thanks to their click-in/click-out design. 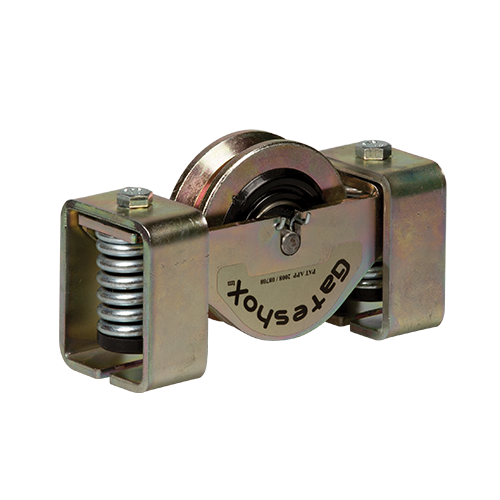 Working on much the same principle as vehicular shock absorbers, GateshoX help absorb the load of the gate for smoother travel that not only reduces noise but considerably minimises the normal wear and tear associated with sliding gates. The patented wheel system is suitable for both angle and round rails and will ensure that your gate keeps on sliding happily and virtually noiselessly for many years to come. There’s something just a little mediaeval about a noisy gate, isn’t there? Lumbering dejectedly along its rail, seemingly enjoying the journey as much as a person would enjoy an impromptu root canal – a noisy gate is a sad and loathsome thing to behold. It brings to mind images of dark, ominous castles with vast corridors and dungeons and possibly inhabited by Vincent Price. With GateshoX, rattling, squeaking and general sounds of anguish are things of the past! The wheel bracket has been laser cut, CNC bent and electroplated for the ultimate in ruggedness and longevity. GateshoX are an absolute cinch to change thanks to their innovative click-in/click-out design. Part of the natural life cycle of any sliding gate system, not just the particularly vocal ones, is rail corrugation. Rail corrugation is a frequently occurring rail wear pattern that occurs as a direct result of the interaction between the gate wheels and the track, to put it in very science-y sounding terms. To put it in laymen’s terms, it’s basically the deformation of the track caused by the repeated movement of the gate. Whichever way you phrase it, the end result is usually sanity-shattering noise and excessive wear and tear. GateshoX can be adjusted according to the weight of the gate (up to 400kg) and will keep your track in tip-top shape. You’ve automated your gate with a CENTURION D10 Turbo or D2 Turbo. You now enjoy the security and convenience that comes with lightning-fast opening and closing. Choose a winner to carry your sliding gate when it’s barreling down the track. Choose GateshoX. Absorbing shock and extending bearing life.